If you’re an ordinary tortoise, growing your shell might take you more than 150 years. But if you’re a tortoiseshell butterfly, life goes by much more quickly than that. It was such a cool and wet spring on Palouse Prairie in eastern Washington, that it didn’t seem like there were as many butterflies around as normal in early summer. 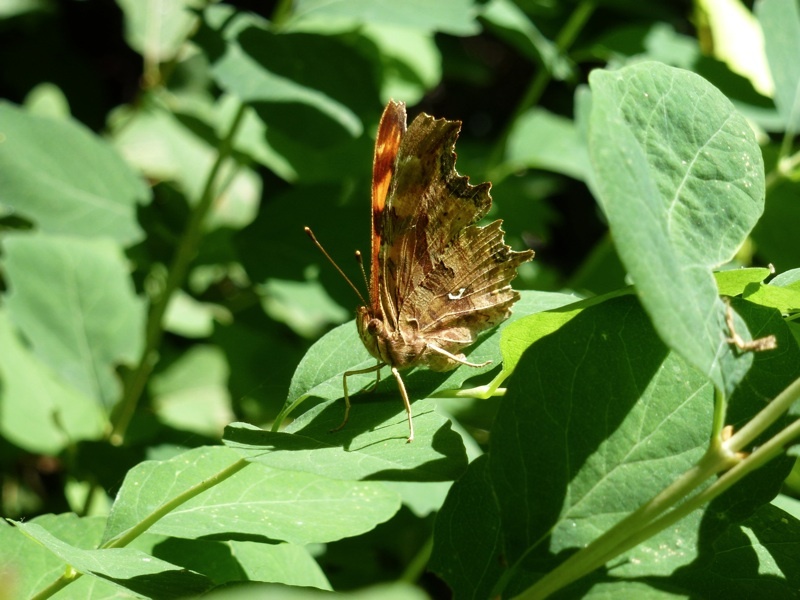 So it was a pleasant surprise to find two species of tortoiseshell butterflies flying in or near the WSU Arboretum & Wildlife Conservation Center later in the year. One day in late July, I hiked down a nature trail through the small arboretum woodland to look at a tree that had fallen across the path. The afternoon was waning, but several orangish butterflies were chasing each other around in a sunlit opening in the woods. And they also were chasing around tiger swallowtail butterflies about 20 feet up in the air. Downed tree across a portion of a nature trail in the WSU Arboretum & Wildlife Conservation Center. Photo. Western tiger swallowtail butterfly (Papilio rutulus). Source: Wikipedia. Photo. 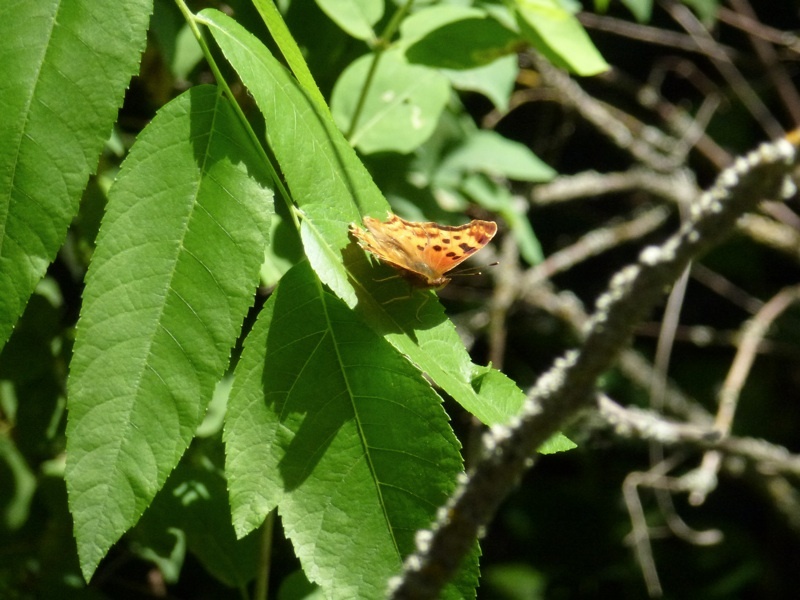 Anglewing or Comma Butterfly roosting on leaves of an ash tree in the WSU Arboretum & Wildlife Conservation Center. Curious to identify these aggressive little guys, I inched over to where one landed on a branch and spread its wings to soak up some warm sunshine. The orange, sunbathing butterfly occasionally flitted around the forest opening, but seemed to enjoy the late afternoon sunshine filtering into the woods and politely let me take a few pictures. Without knowing exactly what species of butterfly it was, it certainly seemed like it was defending an area or at least chasing away other butterflies that encroached into the forest opening. While I could understand that perhaps it was a male defending an area or seeking mates, I wondered why it would waste precious time and energy being aggressive towards a completely different species like the western tiger swallowtail. Photo. 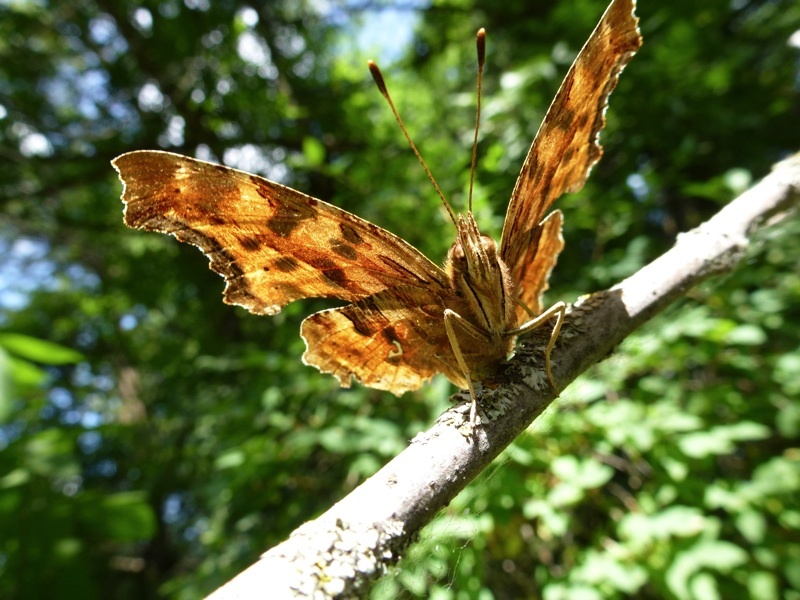 Angelwing or Comma Butterfly in the WSU Arboretum & Wildlife Conservation Center. Notice the cryptic underwing markings which help camouflage the adults when they close their wings. Photo. 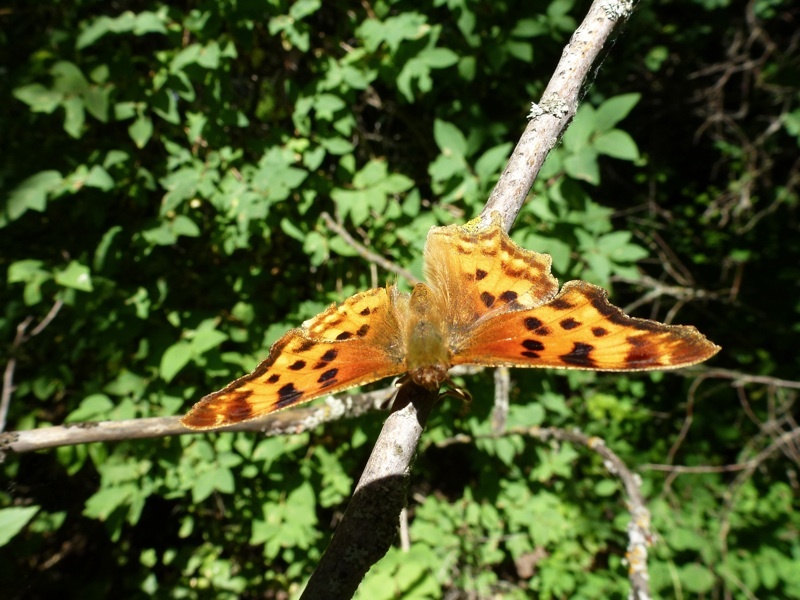 Angelwing or Comma Butterfly in the WSU Arboretum & Wildlife Conservation Center. The orange butterflies appeared to be what are called Anglewing or Comma butterflies. My best guess, purely from matching photos in the field guide, The Butterflies of Cascadia, is that these little gems are Satyr Anglewing (Polygonia satyrus) butterflies. The next surprise came when I looked up their natural history, wondering how they came to be in the arboretum woodland. That is, how do you grow a tortoiseshell? Photo. Stinging nettle in the WSU Arboretum & Wildlife Conservation Center. Photo. Leaves of Stinging Nettle in the WSU Arboretum & Wildlife Conservation Center. Fruits of stinging nettle in the WSU Arboretum & Wildlife Conservation Center. The black, spiny caterpillars of tortoiseshell butterflies commonly feed on the leaves of stinging nettle (Urtica dioica), although hops and willows may also be used. Stinging nettle is so named because of the hollow stinging hairs (trichomes) on leaves and stems that inject histamine and other chemicals into the skin of animals even when the plant is barely touched. The chemicals produce an intense stinging and itching that lasts for minutes. However, stinging nettle has long been used as a medicinal plant and a nutritious food by people around the world. Stinging nettle is rich in vitamins and may contain up to 25% protein, dry weight. Native Americans harvested stinging nettle in spring and cooked it to remove the stinging chemicals. When cooked, it has a flavor similar to spinach and may be used in soup, pesto, polento, and is considered a popular vegetable in many places in the world. 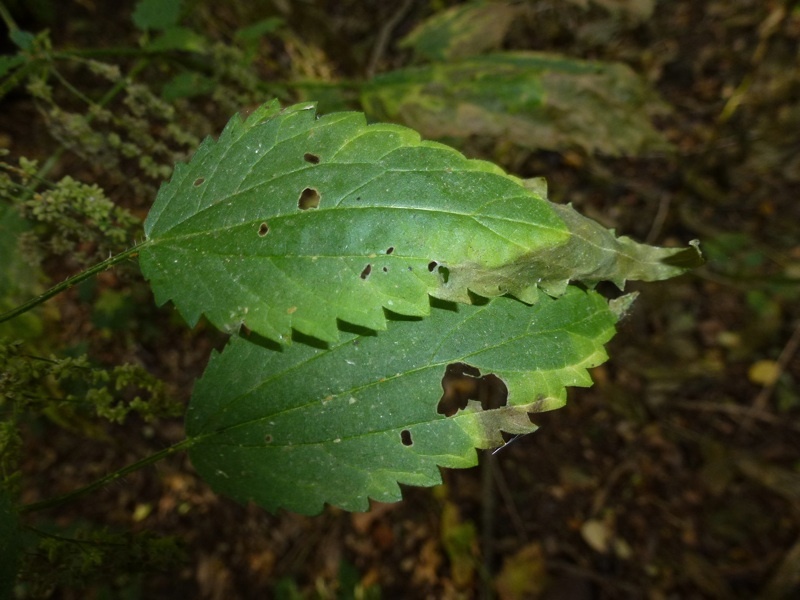 Armed with this knowledge, WSU students in restoration ecology looked around the arboretum landscape, and sure enough, we found a patch of stinging nettle in a moist portion of the woodland (photos above). This knowledge now factors into the ecological design and management of the arboretum woodland. 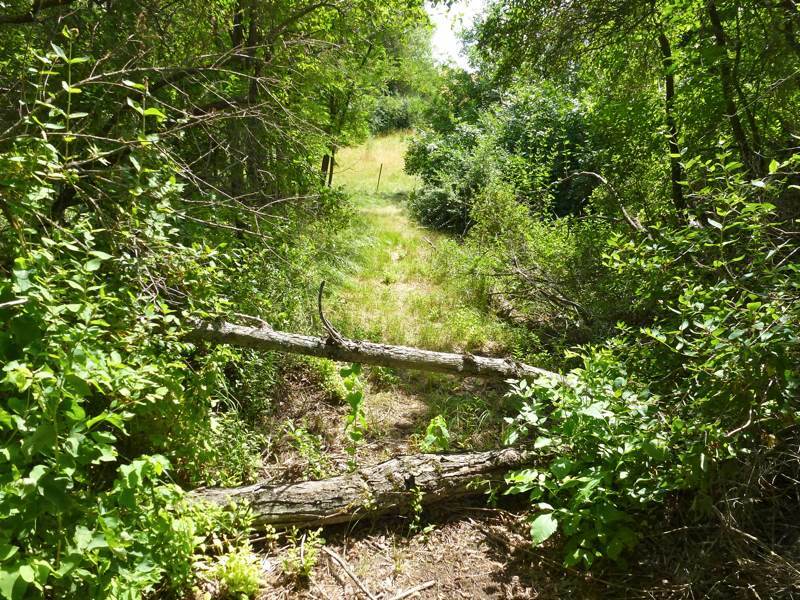 We are refining the restoration and development plan for the arboretum by studying the landscape, identifying the species of plants and animals that do or could occur in the WSU Arboretum, and by learning about their needed microhabitats. 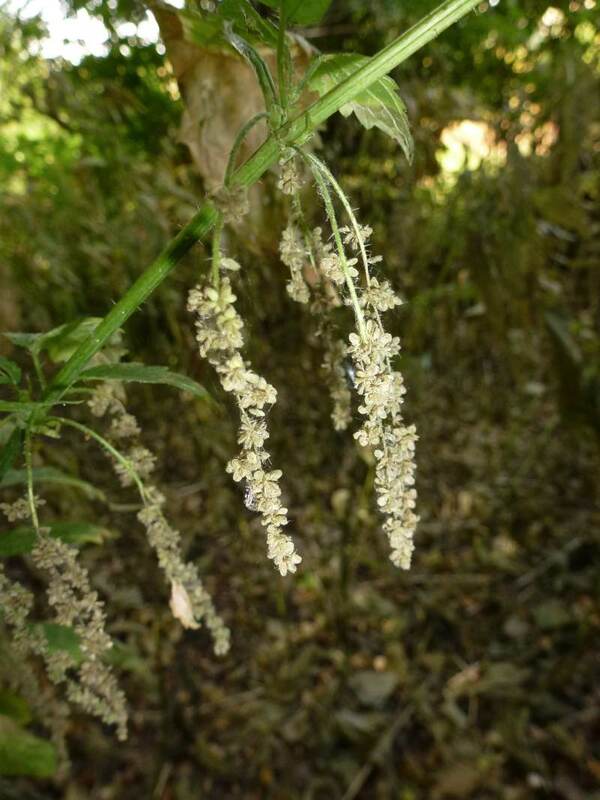 In this case, stinging nettle goes from being a nuisance plant, or even a weed in some people’s minds, to being an interesting element of human culture and also an important part of natural biological diversity that supports valuable insect life in the arboretum. In early September, I was delighted to see another variety of tortoiseshell butterfly, called a Milbert’s Tortoiseshell (Nymphalis milberti) while visiting the nearby Lawson Gardens in Pullman (see the lead photo at top of this post). While I couldn’t get a picture of this distinctive and beautiful butterfly, our friends at Wisconsinbutterfly.org kindly allowed me to make up for my slow trigger finger by using one of their excellent photos to show you what a Milbert’s Tortoisehell looks like. Given that they also do well in gardens where nettles are allowed to grow, we’re hoping to see them appear in the WSU Arboretum. So how long does it take to grow a tortoiseshell butterfly? I suppose one answer for that question is at least a year – if you have all the right ingredients in place. 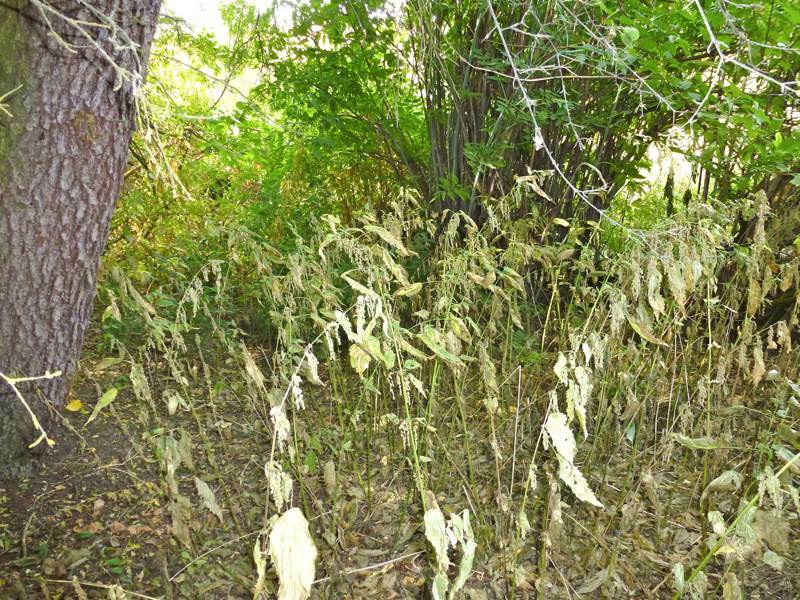 You would need the host plants for caterpillars, nectar and other food sources for adults, such as tree sap from wounds on willow trees, or nectar from the historical lilac plantings in the arboretum. Plus, you’d need to have adequate habitat so that the surviving adults in the fall can hibernate (enter hibernal diapause) and lay eggs in spring on host plants (stinging nettles) to start the life cycle all over again. Photo. Satyr Anglewing Butterfly in the WSU Arboretum & Wildlife Conservation Center. Photo. Underside of Milbert's Tortoiseshell butterfly wings. Source: Wikipedia. You’ll notice one thing about the underside of the wings of these tortoiseshell butterflies – they’re quite cryptic, meaning when the wings are closed, the wing pattern and coloration helps camouflage the adults. Because adults must overwinter, it’s important for them to blend into their surroundings to evade the attention of predators. But now that we have tortoiseshell butterflies in the WSU Arboretum & Wildlife Conservation Center, we plan on keeping them. We are identifying habitat requirements for many other insects and plant and animal species and developing plans for how we might grow them in the future. And with a little luck, we hope that you too might grow a tortoiseshell some day.